Ro-La-Sue Dairy Farm is home to three generations of the Scheibe family that work together to care for 240 dairy cows. The Scheibes have come a long way since first milking 12 cows by hand — they now use robotic milkers and automatic feeders! How has the farm grown over the years? Rod: My dad, Clifford, bought our dairy farm in the 1950s milking 12-15 cows. I started working with him when I was 16 years old and now my children work on the farm as well. We’ve continued to grow and are now milking approximately 240 cows. Clifford: The farm has seen a lot of changes through the years. I started milking the cows by hand. 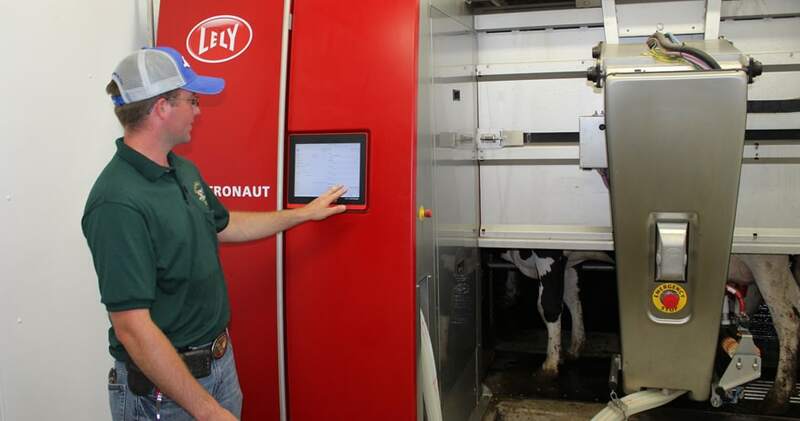 Every few years, we have done something to improve the farm, from building a milking parlor to installing automatic feeders and robotic milkers. Ben: On our farm, we use the newest system they have for automated robotic milkers. The milkers feature a screen on the control panel that attaches to the robotic milking arm to provide data about the cow it is milking, including how long it will take to milk the cow, when she should be milked, body weight and milk weight. The cows enter the milking system without obstacles. Then, the robotic arm washes and dries the underside of the cow before attaching the milking cups. Once she is finished milking, the cups individually and safely pull off the cow and the brushes re-wash her to avoid infections. What are the benefits of robotic milkers? Ben: Using the robotic milkers, the cows are on their own time and schedule doing what they want to do. The cows are fed and milked into four groups allowing us to give extra special care to them. The cows are calmer and udder health has improved because they are milked more frequently. The cleanliness and sanitation with these robots also is remarkable. In addition to the four robotic milkers, we have a feed pusher that comes through every four hours. This keeps the feed close to the cows so they have constant access. Prior to using the milkers, we used a skid loader to keep the feed pushed up. By having this unit, it saves us time, wear and tear on equipment, and eliminates problems. Learn more about the Scheibe Family or meet more Ohio and West Virginia dairy farmers.